While the Head of new UN Assistance Mission in Somalia (UNSOM), Nicholas Kay, hailed Somaliland as an ‘island of relative peace and stability’ in a visit to the region on Wednesday 12 June 2013, Foreign Minister Dr Mohamed Abdilahi Omar declared UNSOM'S presence in Hargeisa not in the best interest of the country. For the first time a high level meeting with a visiting dignitary has ended without a joint press briefing. This is as a result of the visiting UN Special Representative for Somalia Ambassador Nicholas Kay leaving the presidency refusing to answer questions from journalists who had been patiently waiting for the joint press conference. Reasons behind the not usual outcome became apparent after a briefing by the foreign minister Dr Mohamed Abdilahi Omar in which he informed that the newly established United Nations Assistance Mission in Somalia –UNSOM shall not be operating in the country. "Amb. Nicholas Kay has been informed that Somaliland shall not be hosting UNSOM offices in the country" said Dr Omar. According to the Foreign minister this conclusion ensued after discussions between President Ahmed Mahmud Silanyo and Amb. Nicholas Kay at the presidency in which it became apparent that the mandate of UNSOM is specific to Somalia thus has nothing to do with another Sovereign Country like Somaliland. Elaborating on the decision to bar UNSOM from Somaliland Dr. Omar said, "With its current mandate UNSOM is against the sovereignty of Somaliland, its constitution and peoples will"
The Hargeisa authorities succinctly detailed this sentiments to Amb. Kay orally and through a position paper (accessed by Somalilandsun , see below) and it is expected that the Ambassador's diplomatic acumen shall facilitate a reversal of the UNSOM mandate by the Security Council if the United nations remains desirous of political engagement with the country it is yet to recognize. On the issue of usual UN development and Humanitarian interventions president Silanyo and his team who urged for an increase in UN Aid were in acquiescence with Amb. Kay that these interventions in the continue as before through individual agencies like UNDP, WHO, FAO, UNHABITAT, UNICEF etc. On the Somaliland government's ban of UN flights on its airspace Dr Omar informed that until on-going negotiations are concluded only Humanitarian flights shall be allowed while all others operated by UNHAS remain debarred. Following these developments it is not yet clear if the Amb. Nicholas Kay led UNSOM team shall conclude its pre-arranged two days itinerary in the country. I am grateful for your decision to visit Somaliland at such an early stage in your tenure as Special Representative of the UN Secretary-General. My government hopes that your appointment will result in a further deepening of the cooperation between Somaliland and the United Nations. To facilitate this, we would like to state our positions clearly and to share with you our views on how relations between the UN and Somaliland might best develop. As you know, we are guided by the reality that Somaliland is independent. Our people decided in 1991 to end the voluntary union with Somalia which began in 1960 after we obtained our independence from Britain. That decision was endorsed in a referendum in 2001, and in subsequent general elections, in which our people have voted in favour of parties supporting independence. For the people and government of Somaliland, there is no going back. More importantly, it constitutes a contradiction to our constitution which states we are an independent country. We understand that UNSOM's political role is to rebuild a federal Somalia through a comprehensive and integrated international support, while it seeks to open a sub-office in Somaliland. This ignores the reality of Somaliland's existence and functioning as an independent state since 1991 and the self-determination rights of our people. Since the purpose of such an office is to extend the remit of the federal government to Somaliland, my government is of the view that a UNSOM'S presences in Hargeisa will not be in the best interest of our country. Therefore, we cannot allow UNSOM'S political office to function in Somaliland. However, we wish to continue engaging with all UN humanitarian and development agencies, whose support to Somaliland's development is much appreciated. We would like to see an increase in UN development assistance in line with Somaliland's National Development Plan. This will allow Somaliland to consolidate its already considerable democratic and institution-building gains. It will also help us to retain ownership over our development path. But we ask that in order to address Somaliland's specific needs adequately, the UN development programs should be managed from Hargeisa not from Mogadishu. UN support for the consolidation of Somali federal government institutions should be undertaken with full consideration of its potential impact on Somaliland. The recent issue over airspace management clearly demonstrates the risks involved in forgoing a holistic, conflict-sensitive approach. We suggest that UNSOM should take all measures to safeguard Somaliland's achievements in accordance with the principle of "do no harm". 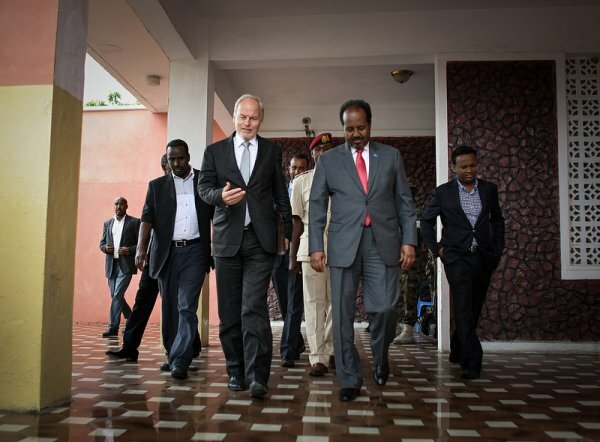 The Dialogue between Somaliland and Somalia provides a neutral, level playing field for the two governments to discuss cooperation on areas of mutual concern such as security, as well as to clarify their future relations, in accordance with the approach endorsed again at the most recent London Conference. The resumption of bilateral discussions in Ankara on 13 April was also welcomed by the international community at last month's conference, and received strong support in the recent report issued by the UN Secretary-General. Somaliland views the Dialogue as an integral component of international efforts to foster peace and stability in the Horn of Africa. There may come a time when your "good offices" may be needed in order to help us maintain momentum in the Dialogue, and we would welcome your assistance with this. We would like to emphasize that, from our perspective, the purpose of the Dialogue is not to negotiate Somaliland's place in a Somali federal structure. Rather, the Dialogue should proceed in accordance with the terms agreed by the two governments in Ankara, Dubai and Schevening, and must respect the independence of Somaliland. Finally, it is important to clarify that Somaliland views Somalia as a neighbour, and one with which good relations are crucial.